With this money I can get away from you. From you and your chickens and your pies and your kitchens and everything that smells of grease. I can get away from this shack with its cheap furniture. And this town and its dollar days, and its women that wear uniforms and its men that wear overalls…. You think just because you made a little money you can get a new hairdo and some expensive clothes and turn yourself into a lady. But you can't, because you'll never be anything but a common frump whose father lived over a grocery store and whose mother took in washing. With this money, I can get away from every rotten, stinking thing that makes me think of this place or you! What could be uglier, more ruthless (and perversely “fun” — for an audience) than dialogue like this from the movie Mildred Pierce starring Joan Crawford. These words are spoken to Mildred (Crawford) by her hateful/ungrateful daughter, Veda. Perfume fanatics, when sniffing a fragrance, “see” things, remember people, places, animals, plants…even if what we’re sniffing is awful, or banal. Sometimes, a perfume provides a complex scenario for me...it "clicks" — with a painting, an event, or in this case, films. When I first wore Penhaligon’s + Meadham Kirchhoff Tralala,1 a woman from the so-called Golden Age of Hollywood came to mind: an actress morphing into a certain character type: a poor, tough, vulgar broad from the sticks, who rises up, takes charge of her life (and sometimes a rich man or two) and “makes it” (or does she?) I thought of Joan Crawford in Mildred Pierce and Barbara Stanwyck in Stella Dallas (both characters get ahead…but lose their guys, and their daughters who are ashamed of them). And then there’s the beautiful (but usually untalented) woman who can’t seem to make things work in life, though she dreams of success; she'll often, in old movies, find true love but not riches or fame. I’m thinking this time of Joan Crawford as Sadie Thompson in Rain and Marilyn Monroe as Chérie in Bus Stop. 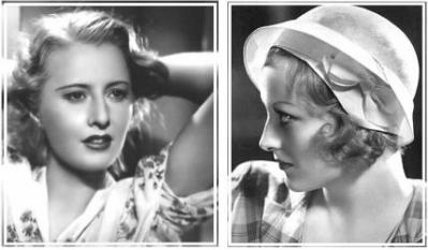 What's even more intriguing is the fact Crawford, Stanwyck and Monroe came from impoverished, troubled backgrounds, yet became legendary movie stars. What was going on in these actresses' heads as they played "characters" so similar to their own scary pasts? In Veda's diatribe above, the words “frump” “cheap” “dollar days” “common” “washing” and “rotten” connect, for me, to Tralala, the perfume (by perfumer Bertrand Duchaufour). Tralala is about as far away from glamour as you can get; it smells of privation, cutting corners, making do, and exertion (it takes sweat to make it in this hard world, right?) Tralala is an expensive perfume made to smell cheap — on purpose, I assume. Perverse, yes, but I think it's a good match for the Meadham Kirchhoff design aesthetic with its tacky, vintage-y, Floozy-Meets-Romper Room clothes.2 Meadham Kirchhoff models often have on clownish, smeared make-up, and oily faces; do they represent kids playing grown-up or grown-ups refusing to renounce "playtime?" For all it brought to mind, I don't like Tralala; where's the FUN, the gumption, the "spark"? I assume Tralala's price is based more on packaging/bottle than juice; it has good lasting power and sillage and though it feels feminine to me, a man could wear it (there are lots of too-sweet/bland fragrances on the men's perfume shelves these days). As I wrapped up my Tralala testing, I found this Barbara Stanwyck quote: "My only problem is finding a way to play my 40th fallen woman in a different way from my 39th." Just tweak the words and numbers and we get an imagined quote from an overworked perfumer: "My only problem is finding a way to make my 79th perfume in a different way from my 78th." I'm hoping Duchaufour's 80th perfume has more to offer than Tralala. Penhaligon's + Meadham Kirchhoff Tralala is available in 100 ml Eau de Parfum, €175/$200. For buying information, see the listing for Penhaligon’s under Perfume Houses. 1. Notes include aldehydes, saffron, whiskey, violet, leather, incense, carnation, myrrh, patchouli, vetiver, musk and vanilla. 2. I'm thinking especially of the Spring/Summer 2012 collection and the Topshop collection from last Fall/Winter; examples here and here (video) and here. Note: images of Barbara Stanwyck in Stella Dallas (top left); Joan Crawford (1932) (top right); and Marilyn Monroe in Bus Stop (middle left) via Wikimedia Commons. Oh no. That is so unfortunate! I have been looking forward to sniffing it after my exams. Where is all the quirkiness and fun if you are going to have a kitchen sink fragrance yet makt it so bland and unadventurous? happy888: well, still sniff it. I’ve seen a few raves…one man’s DULL is another man’s DELIGHT! HA! Anybody who has read “Last Exit to Brooklyn” will instantly recognize that “Tralala” is just about the worst imaginable name for a perfume. They might as well have called it “Brandon Teena” or “All The Victims Of Elizabeth Bathory”. I’m sure they were going for lighthearted, but any well-read person over forty or a quick Google search could have warned them away from that one. pyramus: there is no “light heart” in this one. Exactly what I was thinking. To contradict myself, though, a perfume based on Tralala’s theme song from the movie could be floozily good. Hi Kevin. Interesting to read your take on it, though I’ve heard several good things about this and I’ve been pretty happy with Penhaligon’s last few scents. I’m still looking forward to trying it. Joe…at least don’t shout that in a restaurant! I wasn’t interested in smelling this one anyway – it’s just that nothing (other than aldehydes) in the description grabbed me. I have to be careful with Duchaufours in general. There have been a few florals he’s done that I did like very much*, but very often there is an old vasewater accord, or an ashy one, or a…. murkiness! to Duchaufour scents that make them unwearable for me. But in any case, Angela, I just wanted to say that I loved this review, and I’m very much looking forward to reading your published work. HOLY FRIJOLES. I am sorry to have not read the byline carefully!! Yep, I think you do like those Duchaufours that I can’t manage. All the same, I suspect I’d be less than impressed with this. Mals, I thought it was Angela at first, too – the black and white photos of the classic dames fooled me! I have to say, I tried this a few weeks ago and it almost made me retch ! I couldn’t wait to scrub it off. Who wants to smell like this!? I felt like I’d spent a week in a musty old second hand charity shop full of the scent of dirty old clothes and faded old ladies scents ! Maybe this fits with the designers aesthetic, but as a man, I certainly wouldn’t want to smell like this ! Nathan: we seem to think alike about this one! I went to have a look at those Meadham Kirchhoff pics and video. I used to think really pretty girls could wear anything and look good; but I think I’v just changed my mind! I definitely want to see the bottle in person and may be tempted to buy it for the packaging. The juice sounds horrid but I’ve also read raving reviews so It looks like this will be THE polarizing perfume of 2014! As I’ve commented in the thread about the launch, i don’t care for the backstory spin by any perfume house because they all sound like the “wahwahwah” of all the adults whose legs are the only body part you see. hajusuuri: you’re sure to see the bottle in person before me…let me know what that damn doll head is made of! HA! Plastic (hope not) or ceramic/metal? The Tralala bottle would be the ideal companion for the creepy Marni doll, wouldn’t it? This is one of my favorite Kevin-reviews ever… and that’s saying something. Kevin, this review is a highly provocative work of art. Perversely “fun”, it clicks and is profoundly revealing of our culture. Thank you, Holly…this perfume got me thinking about lots of things. Brilliant Kevin, nailed it ! Yes, that was perfect, LOL! Agree with others – this is a GREAT review! Tralala could be the first Duchaufour perfume I decide not to try, though – and I treasure his early weird ones. Ann Gerard Rose Cut is the Duchaufour I’m most curious about right now, and I want to try his TDCs, Profumi del Fortes and most recent L’APs, too. Noz, ha! True…I can’t keep up. I do want to try Rose Cut, too…may a sample find its way to me…! Classic review! I love the way you ended it with the picture of BD scratching his (nose?) thinking of how to make the 79th perfume different. I was disposed agin this one. Not keen on the name and definitely do not like MK “aesthetic”. But there are aspects of it I like, the leather/saffron accord and the powdery iris. Not nearly enough to get a bottle though! Doña: $200 IS too much for ‘aspects’…ha. I do want to see the bottle in person. Just because I once commented that your reviews reminded me of the old Kael movie reviews…. I remember watching reruns of a now forgotten tv show called “The Big Valley” where the matriarch of the ranching clan was a woman who seemed bigger than the valley. I had no idea that the actress playing her, one Barbara Stanwyck was actually one of the greatest actresses in Hollywood history. When I started watching old movies, boy was taken back. But I never cared for the Stella Dallas type rolls, the ones where she was the masochistic mistress who desroyed herself to protect the marriage of her lover. I certainly would not want to smell like her. (And if I wanted to smell like Mildred Pierce, let me smell like her just from the kitchen, lke a mixture of pie filling and sweat from rolling out the crusts). If one must create a Stanwyck perfume (and really someone must), please give me the smell of her comic heriones. Give me the scent of her Ball of Fire character. She played a gangster’s moll, and night club performer who hides out from the D.A. with a bunch of encyclopedia writers who are totally clueless and need to be taught slang and the latest dances. Complications arise because the most clueless of all these scholars happens to be Gary Cooper. Nerd or not, there is simply no gangster in NYC who could compete with him. Give me the perfume worn by Stanwyck in The Lady Eve. She plays a con-woman who targets another clueless scholar, the heir to a beer fortune, who is happiest in the Amazon researching snakes. This scientist (a very young Henry Fonda) becomes so befuddled by Stanwyck’s perfume that he fails to notice that the cardshark who tries to cheat him on a ship back from Brazil and the “the Lady Eve” , an aristocratic guest at the Hamptons are both the same conwoman. Dilana, yes, I remember The Big Valley, and really only because of Barbara Stanwyck, of course. What an excellent perfume/film review – taking notes so that I can catch up on her best characters. Dilana: I’d LOVE a “Big Valley” perfume! Also, don’t know if you’ve seen it but since you love Stanwyck so much I can recommend ‘A Life of Barbara Stanwyck,’ by Victoria Wilson…almost 900 pages and only the FIRST HALF of Stanwyck’s life…and it ain’t boring! Excellent if disappointing review. Here I was thinking that with great magnanimity I would look past the ill-chosen references to Last Exit in Brooklyn and really appreciate the scent for the scent–which I was sure I’d love because of the listed notes and because it felt vaguely transgressive to yearn for something so politically incorrect… I even ask my dad who lives in Singapore to find me a bottle in case it launched any earlier there…. so far no bottle. I guess that is a good thing. Too bad! Oakland: judging from the notes it looked like a winner for me too…so don’t buy unsniffed! Oh Kevin. I wish you would have chosen a fragrance worthier of such a lovely review. At any rate it made me look for a gorgeous and fragrance from the good old days right now! Any suggestions for a genuine “Gold Rush” fragrance?